This is the fourth and final round of the “new” knockout cup designed to replace the defunct Anglo Welsh Cup following the withdrawal of the Welsh clubs from the competition. As this is the Derby Day fixture, it presumably means that however the pools set up this will be a regular fixture although next season there may well be a third London club in the premiership. Quins already know that they cannot qualify for the knockout stages but they shouldn't need any geeing up for this fixture. James Lang got the game underway and early pressure from Quins led to a well taken try by Big Josh Ibuanokpe with just over a minute on the clock, two points added from the boot of Lang and Quins have the perfect start. The cheers from the home crowd had hardly had time to die down before Saracens struck back; Quins penalised from the restart, Saracens kick to the corner and they create a gap in the line out for number eight Vailanu to run through and score. The tricky conversion attempt was missed, Quins 7 Saracens 5 after only four minutes. The weather is not helping things as both teams try to run the ball as the flow of the game is constantly interrupted by penalties. It takes until the nineteenth minute for there to be another score after Quins are penalised for offside just inside the Quins half. Quite surprisingly to my mind Saracens elect to kick for goal against the very strong wind but a very wobbly kick from flyhalf Malins somehow clears the crossbar to put Saracens one point ahead. Renaldo Bothma up to this point has shown his strength with a couple of rollocking runs through the Saracens defence and Ibitoye is doing the same thing but with a lot more subtlety. What turns out to be a “game changing” moment comes with almost thirty minutes of the game gone when Bothma is shown a red card by referee Wayne Barnes. From where I sat I had no idea what had happened but from Reflink it appears that he led with his arm into the face of a Saracens player, cannot argue with that decision. Despite being a man down Quins still attack whenever they get the opportunity and are awarded a penalty in mid field when Saracens are penalised for what appears to be a deliberate knock on by Saracens, not worthy of a yellow card in the view of the man in the middle. The penalty attempt by James Lang sails well wide of the post from about forty metres out. With a few minutes to go until half time, following a superb kick to the corner by Lang Saracens win the ball and clear the ball to touch as the clock counts down to the break. Pretty close encounter up to this point as reflected in the half time score with Quins coping well enough playing with a man short. The restart kick from Saracens is well taken by Quins, the ball finds its way to Charlie Mulchrone who jinx's his way through the Saracens defence before Saracens are penalised for holding on just inside their half. Superb kick to the corner from Lang, line out ball taken by Horwill, maul set and Elia touches down for a try, couldn`t really ask for a better start to the second half. 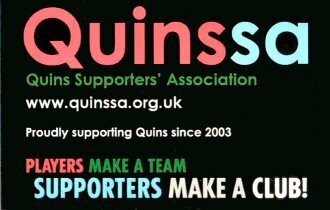 Conversion attempt missed but Quins back in front, Quins 12 Saracens 8 after 42 minutes. Saracens close the gap a few minutes later when another indiscretion from Quins allows centre Alex Lozowski to convert a well taken penalty, Quins now only one point ahead six minutes into the second half. The restart kick from Lang is held up by the wind but just makes the required 10 metres and Quins manage to retain the ball before Mulchrone yet again kicks the ball high into the Saracens half. At least this ball is well chased, and although Saracens fullback Gallagher takes the ball he is forced into touch. Both teams seem to want to out kick each other and it is a Mulchrone charged down ball by lock Joel Kpoku who runs past the tackle of fullback Ross Chisholm to score under the posts. A straightforward conversion by Lozowski and with fifty minutes gone the score moves on to Quins 12 Saracens 18. Quins replace their front row with Ward, Auterac and Swainston as well as Stan South replacing captain Jame Horwill before the restart followed a couple of minutes later with Archie White replacing Luke Wallace. Another change for Quins when Paul Lasike replaced Ben Tapaui as the three quarter point of the match approached and Quins still looking for points. With Saracens penalised for holding on, Lang makes another good kick to touch to well within the Saracens twenty two and set up a period of pressing the Saracens line. A bad pass saw the pressure peter out but Quins definitely look more dangerous when they keep the ball in hand. Nick Auterac receives treatment for a second time and eventually has to leave the field to be replaced by a returning Mark Lambert and at the same time the starting half backs are replaced by Dave Lewis and Demitri Catrakilis with sixteen minutes still to play. Saracens definitely seem to be getting on top towards the end of the match as Quins are paying the price for playing with one man short for so long. Another change for Quins as Dino Lamb has to leave the field to be replaced by prop Big Josh before Saracens add to their scoreline. A break by a Saracens replacement prop, who made 20 metres before passing to flyhalf Malins, left the number ten with a straightforward run to touch down under the posts. Lozowski had the simple task of adding the two extra points with the game almost now out of reach for Quins as they find themselves trailing by thirteen points with ten minutes to go. Despite this they continue to attack and following a good break from Robshaw and then Ward the ball is again spilled resulting in a scrum to Saracens. Quins are (not for the first time) penalised for early engagement and they elect to boot the ball down field which Quins touchdown in their dead ball area. Unfortunately there was yet more points to come for Saracens when from a scrum a good move from the backs created a gap for impressive winger Segun to run in and score their bonus point try right on eighty minutes. Another simple kick for Lozowski gave a final score of Quins 12 Saracens 32. Not sure that a twenty point deficit was a true reflection of the game but Saracens took full advantage of the 50 minute period with an extra man. A lot of kicking from both sides as well as handling errors not helped by the windy conditions and the rain in the second half. A few positives from the game in that Horwill and Robshaw are back playing again with the latter playing for the full eighty minutes. Gabriel Itiboye continues to impress in attack and he has clearly been working on his defence whilst Charlie Walker on the opposite wing had number of good runs and did his best to get himself into the game. An excellent crowd of just over 12500 for a game with absolutely nothing riding on it for the home team, but interestingly declared as a sell out. Presumably this means that all seats not held by a member were sold, a very good job by the marketing team.